The statewide average for regular gasoline hit $3 a gallon yesterday for the first time since October, while new wholesale gas price caps for next week are expected to push prices even higher. Increasing Hawaii prices have mirrored mainland trends that have resulted from geopolitical unrest and concerns over global supplies ahead of the upcoming summer driving season. While some analysts predict a prolonged stretch of high prices, the cost is not expected to dampen demand from April to September. Motorists are expected to use an average 9.4 million barrels of gasoline a day, or 1.5 percent more than last summer, according to the federal Energy Information Administration. Although Hawaii does not have a summer driving season like the mainland, one economist said demand for gasoline is likely to remain just as heavy in the islands. "It's really hard getting people out of their cars," said Jack Suyderhoud, a professor of business economics at the University of Hawaii. Hawaii's average of $3 a gallon, as reported yesterday by AAA's Fuel Gauge Report, continues to lead the nation, coming in 30 cents above the national average and 13 cents more than the next highest state, California. Prices have steadily increased since mid-February as the price caps -- which are set according to prices in three key mainland markets -- have reached their highest points of 2006. New price caps for next week, set yesterday by the Public Utilities Commission, are 13 cents higher than current price ceilings. 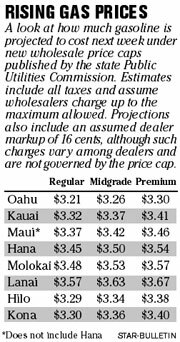 Retail prices are expected to range from $3.21 a gallon for regular on Oahu to $3.57 on Lanai, while the statewide average could jump to $3.27, according to Star-Bulletin projections. Analysts say prices nationwide could remain at or near current levels for the next several months. According to the Energy Information Administration, the nationwide average for regular gasoline is expected to be about $2.62 a gallon, about 25 cents higher than a year ago. Since price caps began Sept. 1, Hawaii's retail average has consistently been above the national average, although the difference has fluctuated. In March, Hawaii's prices for regular were an average of 39 cents above the rest of the country. Other analysts predict a run up to $3 a gallon nationwide as hurricane season approaches. Whether the price cap law remains in effect throughout the summer will be decided in the next few weeks. Both the House and Senate have passed separate bills aimed at suspending the price caps. A compromise would have to be reached during upcoming House-Senate conference committee hearings. If no agreement is reached, the current law would remain in place. House members want to suspend the caps and in their place adopt oversight measures aimed at ensuring fair-pricing practices by oil companies. If the so-called "transparency" measures prove successful, the gas cap law would then be repealed. The Senate has advanced changes supported by Consumer Protection Chairman Ron Menor (D, Mililani) that would suspend the caps but have the Public Utilities Commission continue calculating hypothetical caps under a revised formula. Under that revised formula, caps for next week would be about 17 cents cheaper. If actual wholesale prices rose above the hypothetical caps for two straight weeks, the price regulations would be put back in place for two weeks. House leaders have balked at Menor's proposal, saying it could be too unwieldy to implement.